Smart Watch Archives - Touch Display Research, Inc. 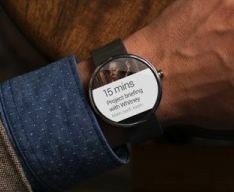 The Moto360 has a round flat display, which is unique. 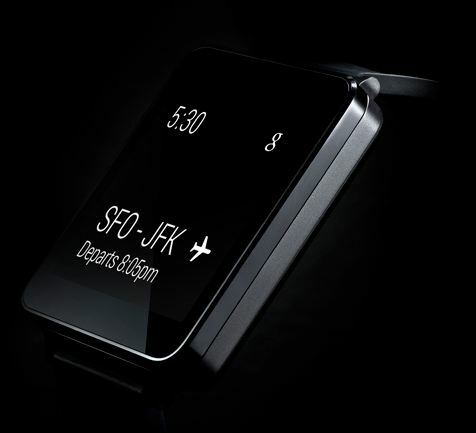 On the other side, LG’s G Watch has a common rectangle flat display. LG indicated they’ll announce the spec in a few months. As we covered before, LG has released G Flex mobile phone with a plastic curved AMOLED display in 2013. The fact that LG didn’t use a curved display on the watch is very strange, this indicated their curved AMOLED display capacity is still small, or yield is still low. Samsung claims the Gear Fit is “the industry’s first curved, super AMOLED wearable device”. I think that is correct. As Touch Display Research reported in our “Flexible and curved display technologies and market forecast” report, we believe flexible and curved displays are more ergonomic for the wrist, and larger-sized flexible displays could fit better and show more information. The Gear Fit is what a smart watch should look like. This entry was posted in Displays, Flexible curved display, smart watch, Touch screens, wearable and tagged curved display, flexible and curved, flexible display, G Flex, G Watch, Galaxy Fit, Google, LG, Moto360, Motorola Mobility, round display, Samsung, Smart Watch, wearable on March 19, 2014 by jennycolegrove. This morning, I was reading Wall Street Journal and laughing. I must share with my readers. Sometimes, we love someone or something so much, we can put up with it. The Force’s display is only 0.7 inch, the smallest among the recent released smart wearable devices. We recommend Fitbit to use a bigger and curved display on the next generation wristband. Touch Display Research forecasts 30 million units flexible and curved displays will be shipped for smart watch application by 2023. This entry was posted in Company News, Displays, Flexible curved display and tagged Fitbit, flexible and curved, flexible watch, Force band, market forecast, skin rashes, Smart Watch, wearable devices on February 15, 2014 by jennycolegrove. This week Korea news chosun.com reported a rumor that Apple’s iWatch will adopt a “plastic OLED”. It quoted an “industry source” said “Apple is developing three different models of the iWatch — a 1.3-inch, 1.4-inch and 1.5-inch prototype”. Back in June 2013, Touch Display Research has forecasted that Apple will adopt AMOLED within 18 months. Some of our industry friends asked me which company might be supplying plastic OLED to Apple. It is very challenge to get Apple’s insider information, but Touch Display Research believes that 7 companies could be the potential suppliers of flexible curved OLED display: Samsung Display Corp, LG Display, Futaba, AUO, Innolux, Sharp, NVO, etc. As we covered last week, Samsung has announced to release a mobile phone with curved displays in October 2013. Here are the possibilities for Samsung’s curved display technologies. This entry was posted in Displays and tagged AMOLED, Apple, AUO, curved display, flexible display, Futaba, Innolux, iWatch, LG, OLED, PMOLED, Samsung, Sharp, Smart Watch, Supplier, technology, touch display research on October 3, 2013 by jennycolegrove.